The Islamic State (ISIL) has reportedly threatened Facebook founder Mark Zuckerberg and Twitter founder Jack Dorsey over the chief executives’ efforts to combat terrorism on their social-media platforms. In a 25-minute propaganda video, purportedly released on Wednesday (Feb. 24) by a group of ISIL supporters called the “Sons Caliphate Army,” Dorsey and Zuckerberg are depicted alongside each other in bullet-hole ridden images engulfed with flames, as shown in screenshots captured by news site Vocativ , which discovered the video on the social-media platform Telegram. The video, called “Flames of the Supporters,” was also authenticated by Storyful . A journalist at the company, which verifies news from the web, told Quartz the video was authenticated based on where it was originally hosted and the pattern of sharing that followed on social media. The video also shows the group hacking into Facebook and Twitter accounts, changing profile pictures, and then posting propaganda to the platforms. It reportedly claims that ISIL has hacked more than 10,000 Facebook accounts and 5,000 Twitter profiles. ISIL has frequently turned to slick, sophisticated videos as part of their propaganda strategy, which is often spread through social media. Facebook and Twitter have faced criticism for their responses to terrorism-related content in the past, and are vocal about their efforts to remove terrorist propaganda from their platforms. Facebook has said that profiles, pages and groups associated with terrorist organizations are banned from the site and that any content condoning terrorist acts will be removed. 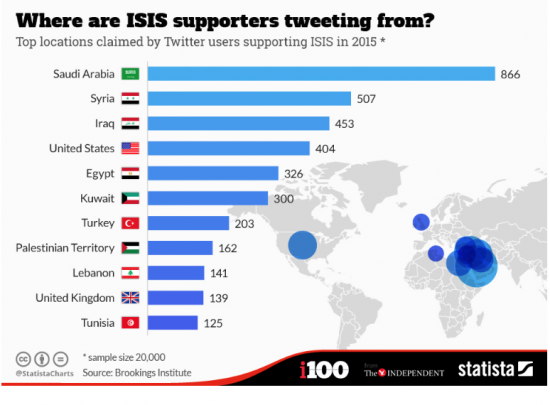 And, earlier this year, Twitter said it suspended more than 125,000 accounts for threatening or promoting terrorist acts, the majority of which were related to ISIL. The company has been targeted by ISIL supporters before, through tweets calling on people to assassinate both Dorsey and Twitter employees . But they, and other tech companies , also have to balance increased anti-terrorism efforts with users concerns over privacy, censorship and freedom of speech. The latest threats—issued on Wednesday night— came shortly after Facebook, Twitter, and dozens of other tech companies and advertising agencies met with the US Justice Department to discuss how to fight extremist propaganda and recruitment efforts online. Neither Facebook nor Twitter have released statements in response to the video. Both companies told Quartz they would not comment on it.